Emerging from his final legislative session, Republican Gov. Rick Scott holds a small lead over incumbent Democrat Bill Nelson in a potential U.S. Senate race that could help determine control of the Senate, according to a poll released Monday. The poll of likely voters, conducted this month by the Tallahassee-based firm Clearview Research, shows Scott receiving 43.3 percent of the support, while Nelson gets 41.3 percent. The difference is within the poll's margin of error of 3.58 percentage points. Scott has not announced that he is running for the Senate but is widely expected to do so — and no other prominent Republicans are running against Nelson. After the annual legislative session ended Sunday afternoon, Scott indicated a decision on entering the high-profile race could be weeks away. Who the heck is Bill Nelson? 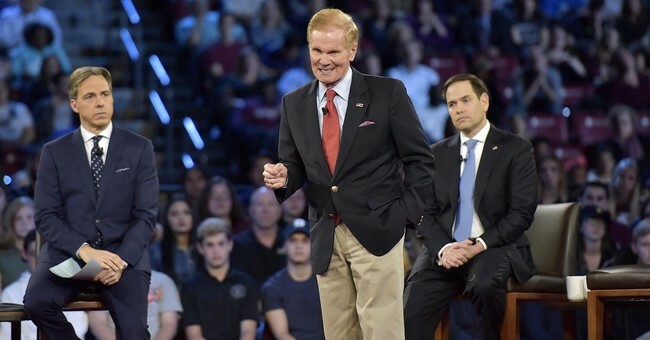 A new poll suggests that about half of Florida’s voters – 49% – don’t know enough about the man who has been their U.S. senator for 17 years to form an opinion about the job he’s doing. So, band name recognition, botching the CNN town hall event, and now he’s dealing with new polling showing that almost half of Floridian voters think the economy has improved from last year. A large part of that is due to the Trump tax bill, which the Democrats universally opposed. Moreover, a majority of Florida voters approve of that GOP tax reform package that was signed into law in December of 201; a law that’s incentivized companies to re-invest back into America. Over 250 companies have given bonuses to their employees. Over three million workers have benefitted from the Trump tax package. The overwhelming majority of those who benefit are the middle and working classes—and Democrats decided to screw them over in order to win the 2018 elections. Also, Nelson has shown his hand on gun control, namely saying that the issue will help his party on the ballot. He also appears to be taking advantage of this community’s grief to list-build, which will undoubtedly help his campaign. Politico reported last year that the ad campaign in Florida could cost $3 million to run a weeklong media blitz in the Sunshine State. With low name-ID and a rather soporific-style of retail politics, Nelson isn’t a person who seems like he can make people open those checkbooks. In that piece, Nelson only had $5 million in the bank. It’s increased since then, but his cash on hand is still below $10 million.